Dassault fighters and attack aircraft have always played an important role with the French Aéronavale. 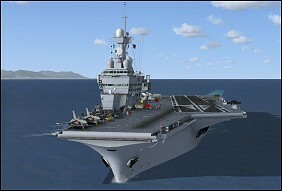 And from the Etendard IV to the Rafale M these aircraft have been well represented in Flight Simulator. 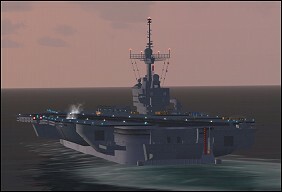 Thanks to the generous work of addon developers there have also been several French aircraft carriers made available. 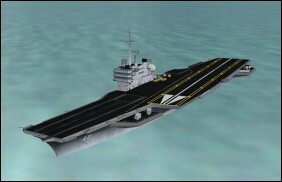 Listed below are some third-party freeware aircraft carrier scenery packages. Notes: Complete package; includes ship. FSX 2D panel and camera views (10) for the CDG (R91) by Sylvain Parouty. Complete package; includes ship. Notes: Designed for FSX/Acceleration. Moving ship option. Package includes populated and empty deck versions. Static aircraft include Rafale M, SEM and E-2 Hawkeye. Animations and plane guard chopper options require use of RFN TACAN gauge v4. More Info. Notes: FSX/Acceleration improvements. New textures by Jonathan Hilaire. Static aircraft of Rafale M, E2-C "Hawkeye", Super Etendard Modernisé, and Panther "Pedro" by Radium. More images. Notes: For FS2004. Launches and traps AI Rafale M's. 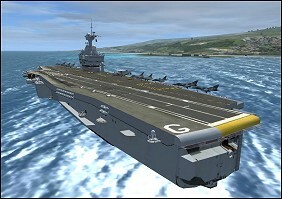 Included in MAIW Rafale scenery AI aircraft package. Notes: Includes full suite of navigation aids so you can find your way back. 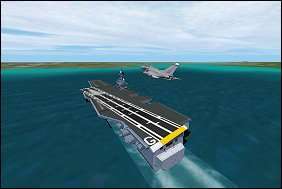 Versions for FSX/FS2004/FS2002/CFS2. Notes: For FS2004/FSX. 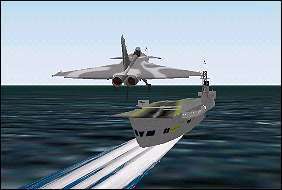 Part of Carrier Strike Force payware package. Moving carrier, missions, Rafale M aircraft. Notes: Designed for FSX/Acceleration. Moving ship option. 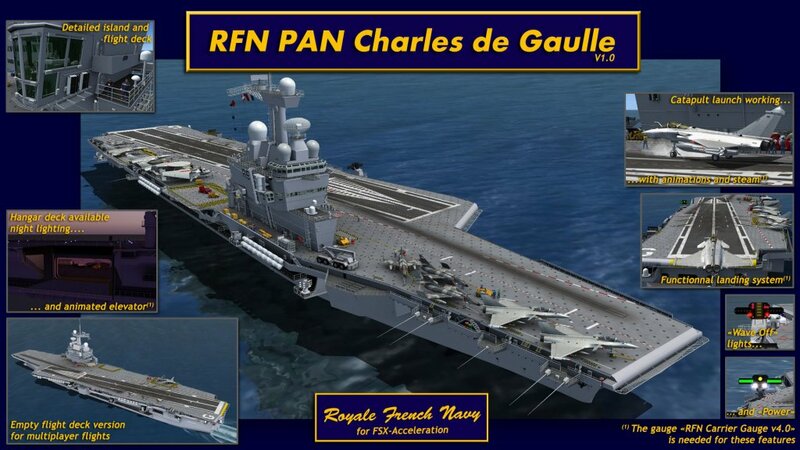 Package includes both Clemenceau and Foch carriers with static aircraft in 1975 schemes. Configured as "PA2" (Reserve/training) with Etendard IVM and Zephyr on deck. 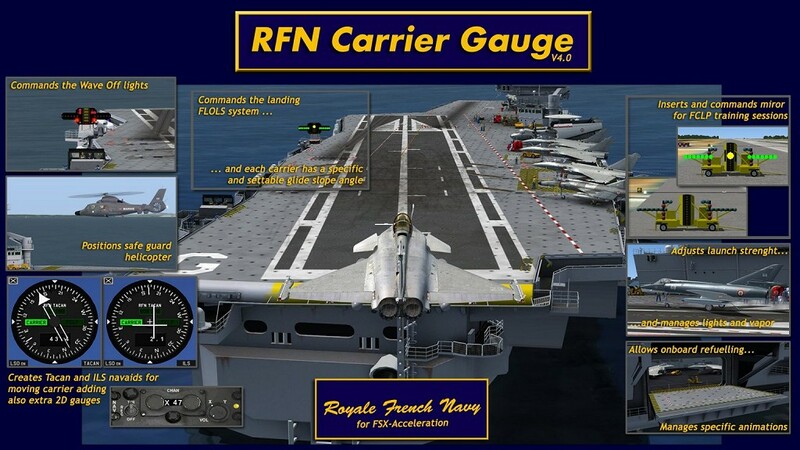 Add-on: FSX Panel and Cameras for French Aéronavale Carrier "Clémenceau"
Notes: FSX panel and camera view (7) for the pilotable Clemenceau v2 by Sylvain Parouty. Notes: Designed for FSX/Acceleration. Moving ship option. 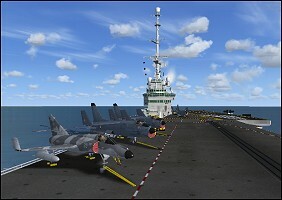 Includes F-8E(FN), SEM, and Alizé aircraft on deck. v1.1 update mentioned in v2 Readme for AI Traffic. 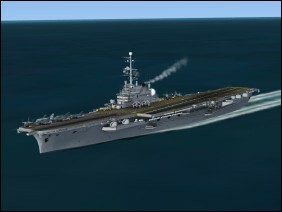 Notes: New textures for ship and onboard aircraft to convert RFN FSX Foch to São Paulo. Also included moving carrier routes. Requires Foch-Clemenceau v3.20 below. Notes: Designed for FSX/Acceleration. Moving ship option. 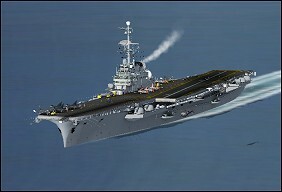 Package includes both Clémenceau and Foch carriers with static aircraft in 1975 schemes. Configured as "PA1" (Alert) with Crusader, Etendard IVM and Alizé on deck. Notes: Designed for FS2004. NAe São Paulo (A12) is a Clemenceau-class aircraft carrier currently in service with the Brazilian Navy. 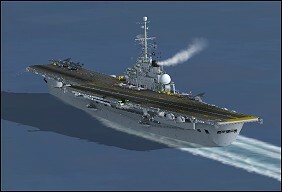 The São Paulo was first commissioned in 1963 as the French Navy's "Foch", and transferred to Brazil in 2000. ArrCab Cable Catch Zones. Notes: Designed for FS2004. 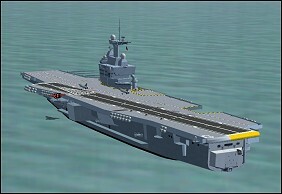 Earlier version including more deck details and weapons systems. Notes: A place to fly the Super-Entendard and Rafale M to and from. Once you've mastered landing a Mirage at 180kts try locating and landing on this postage stamp. Designed for FS98. Header photograph Copyright 1987 SIRPA Air.